Equip-Bid.com Auctions is a full service internet auction company dedicated to having the best customer service possible. Whether you are a buyer or seller, are committed to providing 100% satisfaction with your experience. Customer satisfaction is the very cornerstone of our business and without satisfied customers, our business cannot continue to grow! If we can assist you in any way, please do not hesitate to let us know. As a full service auction company, the staff at Equip-Bid is able to handle every aspect of the auction for the sellers, whether it is bankruptcy liquidation or selling equipment which is no longer needed. Once we have discussed the terms of the contract, we will professionally photograph and inventory the catalog of items for the auction. We then post the items online for a specified duration of time and handle inquiries about the items from the buyers. Finally, Equip-Bid will handle all processing of payments and settlements with the buyers, mailing a check to the seller. This process takes all of the work and stress away from the seller. 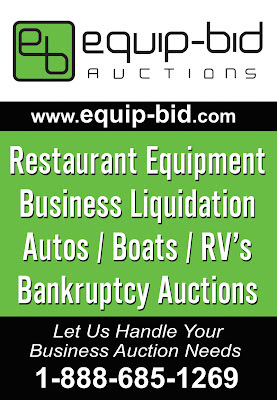 Equip-Bid.com Auctions is licensed, bonded, and insured to handle your auction needs, whatever they may be. We specialize in business and restaurant liquidations, autos/boats/rvs, and construction/farm equipment. We are able to reach a much wider audience than a traditional auction by allowing buyers to place bids anywhere they have internet access (including on their cell phones.) Equip-Bid advertises not only locally, but throughout the region and country including but not limited to newspaper and television ads, internet advertising, and direct mailing. This extensive advertising ensures the items being sold will bring the best possible price for the seller. To find out how Equip-Bid.com Auctions can meet your unique needs, please feel free to contact us with any request. Let us show how we are equipped to meet your needs!